It’s holiday shopping season – which means millions of people in North America are spending more time out and about in malls or dense shopping areas where stores are plentiful and the best restaurants are in high demand. It also means that there is a lot of on the fly searching going on via people’s mobile phones for the right place to shop or eat. For most of us, holiday shopping is a pretty stressful task to begin with and anything that makes it more difficult to get the job done is going to make us (even more) annoyed. So when I pull out my iPhone to find a place to have lunch, while struggling to keep my two year old nearby I don’t have the patience, or ability, to try to zoom in and squint at a pdf menu on a restaurant’s website or that I found on a search engine. For me, it’s not a matter of judging the restaurant for having a hard to read menu, I just end up dismissing it altogether in favor of a place I can be confident will have what I am looking for. As consumer behavior evolves and mobile devices become an integral part of shopping experience, it’s more and more essential that your information is mobile friendly. For restaurants that means turning your menu into a digital menu which is easy to read from anywhere. I mean, which of the following two restaurants are you more likely to choose from your phone? 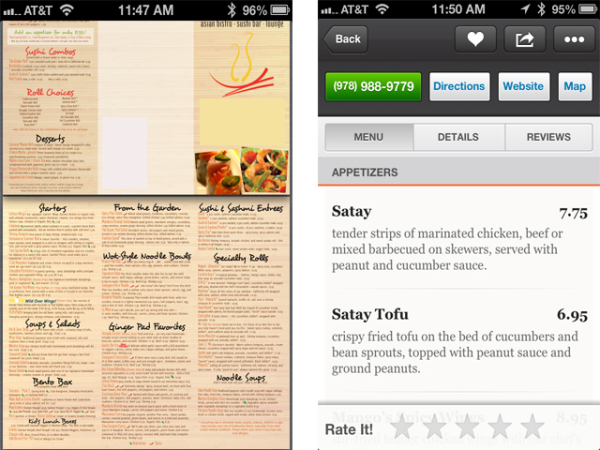 Want to make your business’s menu mobile-friendly? SinglePlatform can help!